Christopher Russell Edward Squire (4 March 1948 – 27 June 2015) was an English musician, singer and songwriter best known as the bassist and a founding member of the progressive rock band Yes. He was the longest-serving original member, having remained in the band until his death and appearing on every studio album released from 1969 to 2014. 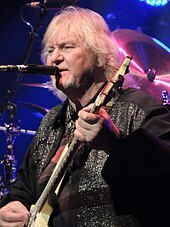 In May 2015, Squire announced a hiatus from Yes after he was diagnosed with acute erythroid leukemia, and subsequently died on 27 June at his home in Phoenix, Arizona. 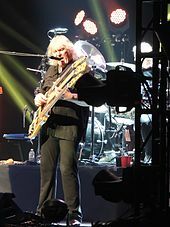 The band's first show of their tour with Toto on 7 August 2015 marked the first Yes concert ever performed without Squire, with longtime friend and frequent collaborator Billy Sherwood performing in his place. From 1991 to 2000, Rickenbacker produced a limited edition signature model bass in his name, the 4001CS. 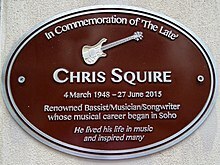 Squire released two solo albums, Fish Out of Water (1975) and Chris Squire's Swiss Choir (2007), a Christmas album. He was posthumously inducted into the Rock and Roll Hall of Fame as a member of Yes in 2017. Squire was born on 4 March 1948 in the north west London suburb of Kingsbury, to Peter and Joanne Squire. He grew up there and in the nearby Queensbury and Wembley areas. His father was a cab driver and his mother a secretary for an estate agent. As a youngster Squire took a liking to Lena Horne and Ella Fitzgerald records belonging to his father, though his main interest was church music. At age six, he joined the church choir at St. Andrew's in Kingsbury as a soprano with Andrew Pryce Jackman, a friend of his who lived nearby. The choir got to perform at St. Paul's cathedral. Their choirmaster, Barry Rose, was an early influence on Squire. "He made me realise that working at it was the way to become best at something". Squire also sang in the choir at his next school, Haberdashers' Aske's Boys' School, then located in Hampstead. He played the harmonica on his way home from school. Squire did not consider a music career until the age of sixteen when the emergence of the Beatles and the Beat music boom in the early 1960s inspired him to "be in a group that don't use music stands". A school friend recommended Squire to take up the bass after pointing out his tall frame and large hands, thinking they were ideal for playing the instrument. Squire then purchased his first bass, a Futurama, which he described as "very cheap, but good enough to learn on." In 1964, on the last day before the summer holidays, Squire's headmaster suspended him and a friend for having their hair too long and they were given two shillings and sixpence to have it cut. Instead, they went home and never returned. After his mother took him to a recruitment agency and enquired for work related to music, Squire landed work selling guitars at a Boosey & Hawkes shop in Regent Street. He used the staff discount offer to purchase a new bass, a Rickenbacker 4001, in 1965. Squire's first band was the Selfs, a rock and rhythm and blues band that featured Jackman on keyboards and Martin Adelman on drums. Their first public performance took place at The Graveyard, a youth club in the hall of St. Andrew's. In 1965, following several personnel changes, Squire, Jackman and Adelman teamed with singer Steve Nardelli, guitarist John Painter, and drummer Gunnar Jökull Hákonarson to form a new group, the Syn. The group performed Tamla Motown covers before they changed direction towards psychedelic rock. After several months, Painter was replaced by guitarist Peter Banks. The new line-up gained a following large enough to secure a weekly residency at the Marquee Club in Soho, which was followed by a recording contract with Deram Records. The band once opened for Jimi Hendrix at the venue, "So I saw what was possible, and I just had this innate faith that I was going to make it." Together they released two singles before they disbanded. Squire was fond of using LSD in the 1960s; a visit to the UFO Club on the drug on Friday which lasted through Saturday, and recovery on Sunday, became a regular event until a 1967 incident where he had a bad trip on a friend's home made LSD. When the police asked him to reveal who gave it to him, Squire pretended to be disoriented and made up a story that involved an unknown Australian he met at a Wimpy restaurant beforehand. He recalled, "It was the last time I ever took it, having ended up in hospital in Fulham for a couple of days not knowing who I was, or what I was, or who anybody else was." After his discharge from hospital, Squire spent several months in his girlfriend's apartment, afraid to leave, only managing to visit the corner shop. He spent each day practising his bass playing which resulted in his distinct style, citing bassists John Entwistle, Jack Bruce, Larry Graham, and Bill Wyman as early influences. In September 1967, Squire joined Mabel Greer's Toyshop, a psychedelic group that included Peter Banks, singer Clive Bayley and drummer Bob Hagger. They played at the Marquee club where Jack Barrie, owner of the La Chasse drinking club a few doors down, saw them perform. "The musicianship ... was very good but it was obvious they weren't going anywhere", he recalled. One evening at La Chasse, Barrie introduced Squire to Jon Anderson, a worker at the bar who had not found success as the lead singer of The Gun or as a solo artist. The two found they shared common musical interests including Simon & Garfunkel, The Association and vocal harmonies. In the following days they developed "Sweetness", a track later recorded for the first Yes album. As the band developed, Anderson and Squire brought in drummer Bill Bruford, keyboardist Tony Kaye and Banks for rehearsals. The five agreed to drop the name Mabel Greer's Toyshop; they settled on the name Yes, originally Banks's idea. The band played their first show as Yes at a youth camp in East Mersea, Essex on 4 August 1968. Squire spoke about the band's formation: "I couldn't get session work because most musicians hated my style. They wanted me to play something a lot more basic. We started Yes as a vehicle to develop everyone's individual styles." Squire developed a bass solo named "A Bass Odyssey". In August 1969, Yes released their self-titled debut album. Martyn Adelman, who had played drums with Squire’s first group, did the album photos. Squire received writing credits on four of the album's eight tracks—"Beyond & Before", "Looking Around", "Harold Land", and "Sweetness". When Bruford was replaced by Alan White in July 1972, Squire altered his playing to suit the change in the band's rhythm section. He felt he was "playing too much, though I was never really sure. With Bill, the things that I did felt right ... With Alan, I found that I was able to play a bit less than before and still get my playing across". Squire described his playing on "The Remembering (High the Memory)" from Tales from Topographic Oceans (1973) as "one of the nicest things I think I've ever played". Squire was the only member to play on each of their 21 studio albums released from 1969 to 2014. He was seen as one of the main forces behind the band's music, as well as being "perhaps the most enigmatic" group member. Heaven & Earth was his final studio album. While most of the band's lyrics were written by Anderson, Squire co-wrote much of their music with guitarist Steve Howe (with Anderson occasionally contributing). In addition, Squire and Howe would supply backing vocals in harmony with Anderson on songs such as "South Side of the Sky" and "Close to the Edge". During the band's formative years Squire was frequently known for his lateness, a habit that Bruford often complained about. Because of this, Squire would frequently drive at unsafe speeds to get to gigs on time, once causing an accident on the way to a gig in West Germany after he fell asleep at the wheel, although nobody was injured. As Squire, along with Alan White and Steve Howe, co-owned the "Yes" name at the time, the 1989 ABWH line-up without him (which contained Anderson, Bruford, Wakeman and Howe) could not record under that name. Following Squire's death on 27 June 2015, the band's show on 7 August of the same year marked the first Yes concert ever performed without him. Former member Billy Sherwood replaced Squire during their 2015 North American tour with Toto from August to September 2015, as well as their performances in November 2015, as announced when the band first revealed Squire's disease in May 2015. Squire concentrated overwhelmingly on Yes' music over the years, producing little solo work. His first solo record was 1975's Fish Out of Water, featuring Yes alumnus Bill Bruford on drums and Patrick Moraz on keyboards and The Syn/The Selfs alumnus Andrew Jackman also on keyboards. In 1981, Squire was later a member of the short lived XYZ, short for eX-Yes/Zeppelin, which Squire claimed his father had come up with the name, a group composed of White and guitarist Jimmy Page. XYZ recorded several demo tracks, but never produced anything formal, though two of the demos provided the basis for two later Yes tracks, "Mind Drive" and "Can You Imagine?" Led Zeppelin singer Robert Plant was not ready, despite Page's promises, to get involved with the band so soon after the death of Zeppelin drummer John Bonham. According to Squire, Zeppelin manager Peter Grant objected to the name as the "Y" appeared before the "Z" in the name. The group then "fizzled out". Squire also played a role in bringing Trevor Rabin into the Cinema band project, which became the 90125 line-up of Yes. In later years, Squire would join with Yes guitarist Billy Sherwood in a side project called Conspiracy. This band's self-titled debut album in 2000 contained the nuclei of several songs that had appeared on Yes' recent albums. Conspiracy's second album, The Unknown, was released in 2003. In late 2004, Squire joined a reunion of The Syn. The reformed band released the album Syndestructible in 2005 before breaking up again. Squire also worked on two solo projects with other former Syn collaborators Gerard Johnson, Jeremy Stacey and Paul Stacey. A Christmas album, Chris Squire's Swiss Choir, was released in 2007 (with Johnson, J. Stacey and Steve Hackett). Squire collaborated again with Hackett, formerly of the band Genesis, to make the Squackett album A Life Within a Day, released in 2012. On 19 May 2015, Yes announced that Squire had been diagnosed with acute erythroid leukemia, and would take a break from performing while receiving treatment. In the late evening of 27 June 2015, Squire died from the illness, aged 67, while receiving treatment in his adopted hometown of Phoenix, Arizona. Yes' official Facebook page confirmed the news the next day. Tributes were paid by fellow musicians Brian May, Geezer Butler, Gene Simmons and Tom Morello, as well as bandmates Geoff Downes and Bill Bruford. Squire's death was central to the song "Fragile" from the 2016 collaborative debut album between Jesu and Sun Kil Moon. In the song, Mark Kozelek recounts his experiences as a Yes fan, particularly in light of the death of a friend, also named Christopher. Squire was given a writing credit due to lyrics from his Yes composition "Onward" being quoted through backing vocals. In April 2016 asteroid 2002 XR80 received an official permanent name from the International Astronomical Union in honor of Squire. Asteroid (90125) Chrissquire was discovered 11 December 2002 and is a main-belt asteroid with an orbital period of 4.08 years. Squire's unique tone was very clear and distinct, and his playing was noted for being aggressive, dynamic and melodic. Squire's main instrument was a 1964 Rickenbacker bass (model RM1999, serial number DC127), which he bought and began playing in 1965. Squire mentioned in a 1979 interview with Circus Weekly that he acquired this bass while working at the Boosey & Hawkes music store in London. The instrument, with its warmth, was a significant part of Squire's unique sound. Due to its distinctive tone, which has been compared to that of a guitar, it allowed the bass to take on a more "lead" role, which created a dynamic sound, and suited Squire perfectly. In a 1973 interview for Guitar Player magazine, Squire recalled how he had obtained his distinctive tone at the time by rewiring his RM1999 into stereo and sending the bass and treble pick-ups each into a separate amplifier. By splitting the signal from his bass into dual high and low frequency outputs and then sending the low frequency output to a conventional bass amplifier and the high-frequency output to a separate lead guitar amplifier, Squire produced a tonal "sandwich" that added a growling, overdrive edge to the sound while retaining the Rickenbacker's powerful bass response. This gave his bass sound bright, growling higher frequencies and clean, solid bass frequencies. This technique allowed Squire to use harmonic distortion on his bass while avoiding the flat, fuzzy sound, loss of power and poor bass response that typically occurs when bass guitars are overdriven through an amplifier or put through a fuzz box. Squire claimed to have rewired his bass to stereo, even before Rickenbacker introduced the Rick-O-Sound feature, so he could send the output of the bass (neck) pick-up through a fuzz box, while keeping the treble (bridge) pick-up clean, because the last sounded "horribly nasal" when used with the fuzz effect. He also played with a pick which contributed to the sharp attack as well as using fresh Rotosound Swing Bass strings for every show. Squire's intricate and complex bass playing style has influenced subsequent bassists such as Billy Sheehan, Geddy Lee of Rush, Steve Di Giorgio of Death and Sadus, Pat Badger of Extreme, Jon Camp of Renaissance, Steve Harris of Iron Maiden, Les Claypool of Primus, John Myung of Dream Theater and Robert DeLeo of Stone Temple Pilots. John Deacon of Queen was also inspired by Squire, and told Guitar Magazine Squire was his favourite bass player. In addition to bass guitar, Squire also occasionally played harmonica, piano and 12-string guitar. Squire was commonly known by his nickname, "Fish", and the name is associated with many of his works including his solo record, Fish Out of Water (1975), and the solo piece "The Fish (Schindleria Praematurus)" from the 1971 Yes record Fragile. The name has multiple origins, not least of which is the heteronymic meanings of "bass", describing low frequency sound or the bass guitar as well as the fish. Additionally, Squire's astrological sign was Pisces. Further, in the early days of Yes' career, he once accidentally flooded a hotel room in Oslo, Norway, while taking a shower, and Bill Bruford gave him the nickname. On the 2007 documentary The Classic Artists Series 3: Yes, Bruford says that the nickname arose because Squire spent long periods in the bathroom while they shared a house together in Fulham. Squire's children are Carmen, Chandrika, Camille, Cameron and Xilan. Squire met his first wife Nikki in 1970 at a club in London. They married in 1972. She sang on the 1981 Christmas single "Run with the Fox" and also the track "Hold Out Your Hand" from Fish Out of Water (1975). In 1983, she formed Esquire, on whose first album Chris, Alan White and Trevor Horn assisted. Their family included Carmen, Chandrika and Camille Squire. The couple divorced after fifteen years of marriage. Squire married actress Melissa Morgan on 8 May 1993. She played Brittany Norman on The Young and the Restless and later returned to the daytime programme as Agnes Sorensen. The pair divorced in 2004. His third and final marriage was to Scotland Squire, who gave birth to daughter Xilan in 2008. They resided in the Chelsea neighbourhood of London, and latterly in Phoenix, Arizona. In the 1970s, Squire was a vegetarian for five years, before he returned to eating fish, then meat. He also got involved with cocaine in the 1970s and early 1980s after the band The Eagles, then a supporting act for Yes in the early 1970s, got him into it. He also did heroin at a party hosted by Phil Lynott. 1990: Rock Aid Armenia - a single re-recording of Deep Purple's "Smoke on the Water" (with Keith Emerson, Geoff Downes, Ian Gillan, Bruce Dickinson, Paul Rodgers, David Gilmour, Ritchie Blackmore, Tony Iommi, Alex Lifeson & Roger Taylor), which is also included on The Earthquake Album. ^ a b "Chris Squire R.I.P." UDiscovermusic. 28 June 2015. Retrieved 28 June 2015. ^ a b "Chris Squire to undergo treatment for Leukemia". 19 May 2015. Retrieved 19 May 2015. ^ "Inductees: Yes". Rock & Roll Hall of Fame. Retrieved 20 December 2016. ^ a b c d e f g h i j k l m n o p q Blake, Mark (13 August 2014). "Chris Squire: the hands that built prog". TeamRock. Retrieved 30 November 2016. ^ a b Welch 2008, p. 24. ^ a b c d Hedges 1982, p. 15. ^ Welch 2008, p. 25. ^ a b c d Beggs, Nick (7 October 2004). "The Day the Earth Stood Still: Chris Squire Interview". Kajagoogoo.com. Retrieved 30 November 2016. ^ a b Cohen, Scott (25 November 1975). "Chris Squire: The Survivor". Circus. Retrieved 30 November 2016. ^ a b c d Welch, Chris. : Close to the Edge: The Story of Yes. (London: Omnibus Press, 1999). ^ a b c d e Hedges 1982, p. 18. ^ a b c Soocher, Stan: "Squire's bass fire", Circus Weekly, 13 March 1979, 33. ^ Hedges 1982, p. 19. ^ Wake, Matt (15 July 2013). "Yes Q&A: Chris Squire talks LSD, 'Almost Famous,' Jimmy Page project, current tour featuring classic LPs". AL.com. Retrieved 28 June 2015. ^ a b Welch 2008, pp. 32–35. ^ a b Welch, pp. 22–23. ^ Gill, Chris. Guitar World's Bass Guitar, Fall 2003 issue, p. 22. ^ Yes (Media notes). Atlantic Records. 1969. 588 190. ^ Morse 1996, p. 41. ^ Morse 1996, p. 47. ^ Welch 2008, p. 10. ^ a b c d DeRiso, Nick (28 June 2015). "Yes Co-Founder Chris Squire Dies". Ultimate Classic Rock. Retrieved 28 June 2015. ^ Giles, Jeff (20 June 2015). "Yes Minus One: The History of 'Anderson Bruford Wakeman Howe'". Ultimate Classic Rock. Retrieved 28 June 2015. ^ "YES & Toto 2015 North American Summer Tour". www.yesworld.com. 6 April 2015. Retrieved 11 April 2015. ^ "Yes & Toto 2015 Co-Headlining North American Summer Tour Schedule". 6 April 2015. Archived from the original on 17 April 2015. Retrieved 6 April 2015. ^ "Yes & Toto announce joint tour". 6 April 2015. Retrieved 6 April 2015. ^ a b Whitaker, Sterling (18 April 2013). "32 Years Ago: Ex-Yes and Zeppelin Members Form Supergroup XYZ". Ultimate Classic Rock. Retrieved 28 June 2015. ^ Cashmere, Paul (10 February 2012). "Why The Yes And Led Zeppelin Supergroup Did Not Happen". Noise11. Retrieved 28 June 2015. ^ Deriso, Nick (3 April 2013). "Chris Squire and Billy Sherwood – Conspiracy Live (2013)". Something Else Reviews. Retrieved 28 June 2015. ^ Forman, Bill (February 2006). "Chris Squire Just Says Yes to Syn". Metroactive. ^ Kopp, Bill (5 July 2011). "Yes: A History of Perpetual Change". Musoscribe. Retrieved 28 June 2015. ^ Adams, Bret. "A Life Within a Day". All Music. Retrieved 28 June 2015. ^ "Chris Squire to undergo treatment for Leukemia". 19 May 2015. Retrieved 29 June 2015. ^ Martin Kielty (19 May 2015). "Yes' Chris Squire has cancer". Classic Rock. Retrieved 29 June 2015. ^ Kreps, Daniel (28 June 2015). "Chris Squire, Yes Bassist and Co-Founder, Dead at 67". Rolling Stone. Retrieved 28 June 2015. ^ "Yes bass guitarist Chris Squire dies aged 67". BBC News. 28 June 2015. Retrieved 29 June 2015. ^ "Yes (official) - It's with the heaviest of hearts and... - Facebook". facebook.com. ^ Bonner, Michael (29 June 2015). "Brian May leads tributes to Yes bassist Chris Squire". Uncut. Retrieved 15 November 2015. ^ Frazier, Preston (17 February 2015). "Yes, "Beyond and Before" from Yes (1969): YESterdays". Something Else Reviews. Retrieved 28 June 2015. ^ "The 60 greatest bassists of all time". MusicRadar. 1 December 2014. Retrieved 28 June 2015. ^ Prasad, Anil (2012). "Yes: Propelling forward". Innerviews. Retrieved 28 June 2015. ^ "Rickenbacker". Fotolog. 6 April 2006. Retrieved 28 June 2015. ^ Reed, Ryan. "Top 10 Chris Squire Yes Songs". Ultimate Classic Rock. Retrieved 28 June 2015. ^ Magnus, Nick (May 2013). "Scarbee Rickenbacker Bass". Sound on Sound. Retrieved 28 June 2015. ^ Jeffers, Tessa (27 May 2014). "Cruising to the Edge". Premier Guitar. Retrieved 28 June 2015. ^ Ferris, Leonard (July 1973). "Yes' Bassist Chris Squire". Guitar Player: 42. ^ "Basso Cantante, Continuo Chris Squire's Singing Bass Rings Again With Yes". Bassplayer.com. Archived from the original on 7 July 2011. Retrieved 17 August 2011. ^ Mulhern, Tom (1993). Bass Heroes: Tom Mulhern. ISBN 9780879302740. Retrieved 17 August 2011. ^ Hill, Gary (4 March 1948). "Chris Squire". AllMusic. Retrieved 17 August 2011. ^ "Guitar Magazine - September 1999". brianmay.com. Retrieved 15 November 2015. ^ "1996 Interview". Nfte.org. Retrieved 17 August 2011. ^ The Classic Artists Series 3: Yes. ^ "Esquire". All Music Guide. Retrieved 28 February 2011. ^ Welch 2008, p. 220. ^ Secord, Paul (May 2000). "Conversation with Nikki Squire". Notes From the Edge. Retrieved 28 June 2015. ^ "Melissa Morgan Squire is returning..." TV Guide website. 11 July 2003. Retrieved 28 February 2011. ^ "Broadway World". Retrieved 28 February 2011. ^ Goldstein, Toby. "Ashley Is Back on The 'Y&rR' Scene". The Orlando Sentienal. ^ "Scotland Squire: Yes Chris Squire's Wife". 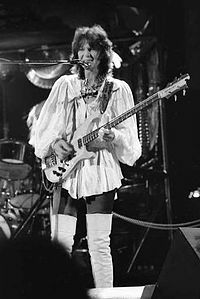 This page is based on the Wikipedia article Chris Squire; it is used under the Creative Commons Attribution-ShareAlike 3.0 Unported License (CC-BY-SA). You may redistribute it, verbatim or modified, providing that you comply with the terms of the CC-BY-SA.